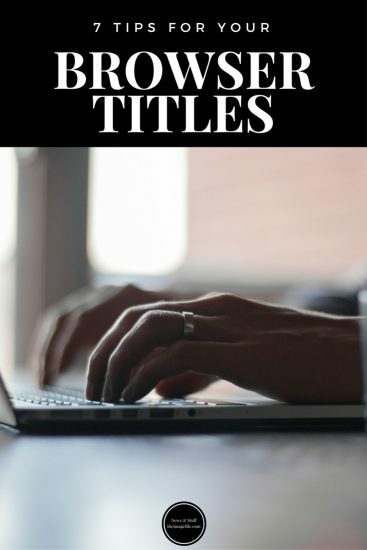 5 Tips for your Browser Titles! The browser title appears at the very top of the browser window. It is the most important words for indexing your website page by the search engines, even though it is not displayed on the page. The search engines see this sentence and display it as the title link in the search results page (the bit that links to your site) just above the meta description. 1. At the moment it is about 60 characters (counting letters and spaces) that are seen (this varies from each search engine), so describe the page concisely. 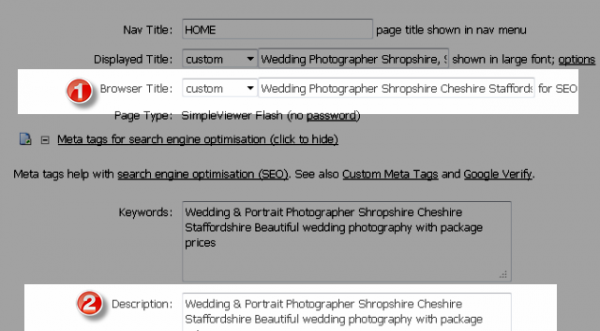 Try not to be too descriptive with the title – include words someone will search e.g. commercial, industrial, studio, portrait, family, event, school, baby, photographers, modern, retro, vintage, great prices, special offers, albums, prints. The browser title is point (1) in both pictures below. 2. Have similar words within the meta description and page content to reinforce the keywords and phrases. The Meta description is point (2) in the picture below. 3. Have pages area specific. Choose popular smaller places in your area, as well as the main city – Kingston-upon-Thames, could include smaller towns – Teddington, Cobham, Weybridge. These don’t need to be included in the main navigation but can simply be text links from your page content. 4. You do not need to add your name to every page browser title. This is just repeated information to the search engines and uses up valuable characters. Great for the home page but use other words for other pages. 5. Look at your competitors appearing above you in the search engine results. What are they doing and would you benefit from similar phrases in your browser titles? The browser title is in the page header. This is not displayed on the page but can be seen by viewing the source of any web page. If you are building your website on theimagefile go to My Websites > Edit Web Pages, and select the page you wish to edit. Near the top of the editing page, locate Browser Title (1), edit as required and click Save All. P.S For more information about browser titles take a look at our SEO brand audit.